Does classical music make you more intelligent? Can we slow down or stop the ageing of our brain? The Rough Guide Book of Brain Training contains 100 days’ worth of puzzles designed to give your brain a thorough workout. Just five puzzles a day will lead to a smarter you. Combining favourites such as sudoku and kakuro with many entirely new puzzle types, puzzle creator Dr Gareth Moore exercises every part of your mind – from processing speed, mental arithmetic and problem-solving to memory and creativity. Every ten days, a test page allows you to chart your progress, while throughout the book Dr Tom Stafford’s incisive and thought-provoking text explores the wonders of our brain and how we can get better at using it to its full potential. 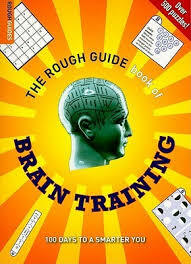 Offering much more than other brain-testing books, this guide is guaranteed to give your brain a thorough workout.